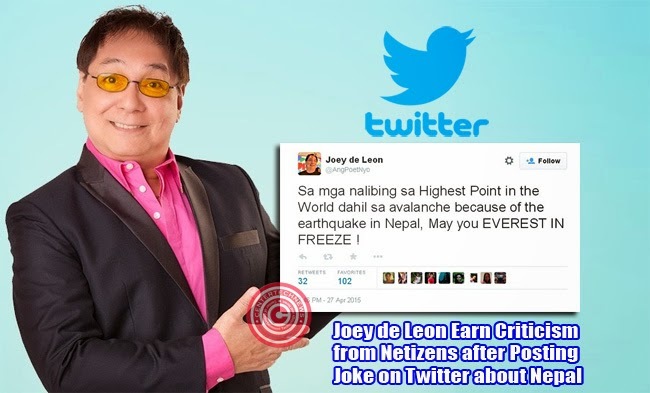 Kapuso variety noontime show host Joey de Leon drew raised eyebrows from netizens after posting a joke on Twitter about the recent earthquake in Nepal. Many had tried to respectfully remind him that though the joke might be funny for others, it is quite untimely. It was on April 26, 2015 when Nepal was struck by a 7.8 magnitude earthquake at its very capital with the tremors being felt in India, China and Bangladesh. Number of deaths raised its toll to 3000 and there are still some suspected to be buried in the ruins. The earthquake also produced avalanche in Mt. Everest which buried climbers who were getting ready for the climbing season in May. Joey de Leon, on April 27, 2015 posted a joke saying that those who got buried in the highest peak of the world brought by the Nepal earthquake can ‘Everest in Peace’. While some netizens admitted that it was a funny Tweet, they also tried to remind him that it could be somewhat insensitive. Many replied to his Tweet asking him to respect those who had been demised by the earthquake. Some say that it isn’t a good time to make such a joke as many are trying to raise funds and help those affected by the disaster. Bakit ganon sa twitter pag hindi nila nakuha joke or not o hindi sila nakaisip nung entry wala ka nang kwenta? I just condoled mga bobo ! Sa mga "righteous" dyan: Do not talk to me about respect for the dead. Kausapin nyo muna creatorsng Walking Dead at mga Vampire series ! De Leon seemed to have been affected by the replies and tweeted a series of reactions saying that some of those who did not get the joke were idiots. In another post he said that those who are ‘righteous’ must first talk to the creators of vampire series and Walking Dead before they tell him about respecting the dead. Some netizens admitted that they are disappointed with the recent tweets from the actor-host while others say that the joke was up to the perception of the readers. Some may say it is insensitive while others think it was funny.